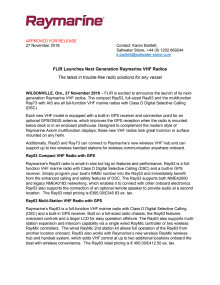 WILSONVILLE, Ore., 27 November 2018 – FLIR is excited to announce the launch of its next-generation Raymarine VHF radios. 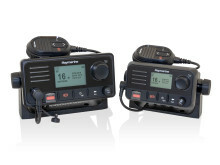 The compact Ray53, full-sized Ray63 and the multifunction Ray73 with AIS are all full-function VHF marine radios with Class D Digital Selective Calling (DSC). Each new VHF modelis equipped with a built-in GPS receiver and connection point for an optional GPS/GNSS antenna, which improves the GPS reception when the radio is mounted below deck or in an enclosed pilothouse. Designed to complement the modern style of Raymarine Axiom multifunction displays, these new VHF radios look great trunnion or surface mounted on any helm. 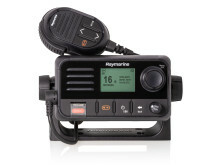 Raymarine’s Ray53 radio is small in size but big on features and performance. 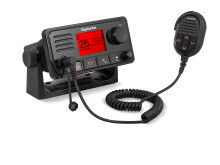 Ray53 is a full-function VHF marine radio with Class D Digital Selective Calling (DSC) and a built-in GPS receiver. Simply program your boat’s MMSI number into the Ray53 and immediately benefit from the enhanced calling and safety features of DSC. The Ray53 supports both NMEA2000 and legacy NMEA0183 networking, which enables it to connect with other onboard electronics. Ray53 also supports the connection of an optional remote speaker to provide audio at a second location. The Ray53 retail pricing is €395.00/£345.83 ex. tax. 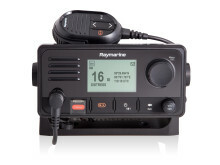 Raymarine’s Ray63 is a full-function VHF marine radio with Class D Digital Selective Calling (DSC) and a built-in GPS receiver. 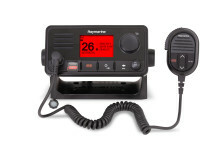 Built on a full-sized radio chassis, the Ray63 features oversized controls and a larger LCD for easy operation offshore. The Ray63 also supports multi-station expansion and intercom capability via a single wired RayMic controller or two wireless RayMic controllers. The wired RayMic 2nd station kit allows full operation of the Ray63 from another location onboard. 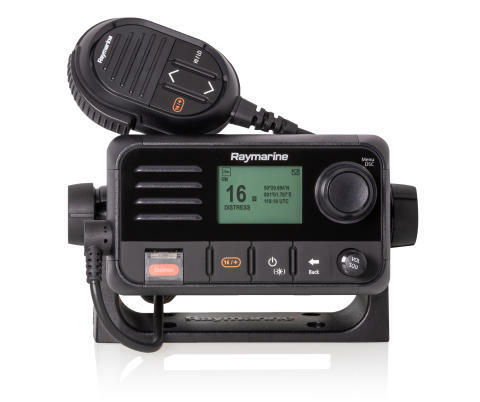 Ray63 also works with Raymarine’s new wireless RayMic wireless hub and handset system, which adds VHF control at up to two additional locations onboard the boat with wireless convenience. The Ray63 retail pricing is € 495.00/£412.50 ex. tax. 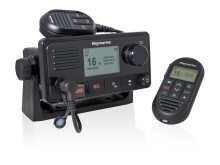 Raymarine’s new Ray73 multifunction VHF is communications central for your boat. In addition to the features of the Ray63, Ray73 adds a built-in Automatic Identification System (AIS) receiver and a powerful loudhailer output. Ray73’s AIS provides collision avoidance and identification details for nearby AIS-equipped vessels to a networked multifunction display, chartplotter, radar, and instruments. 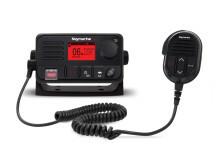 When combined with an optional hailing horn, the Ray73’s loudhailer output allows communication with crew members on deck, those on other vessels, or people on the dock. In addition to Ray73’s powerful public-address capability, it can also generate manual or automatic fog signals when moored or underway. The Ray73 retail pricing is € 695.00/£604.17 ex. tax. The new Raymarine VHF line is available now through FLIR’s network of Raymarine dealers and retailers.